This sheet progresses on from Sheet 1. 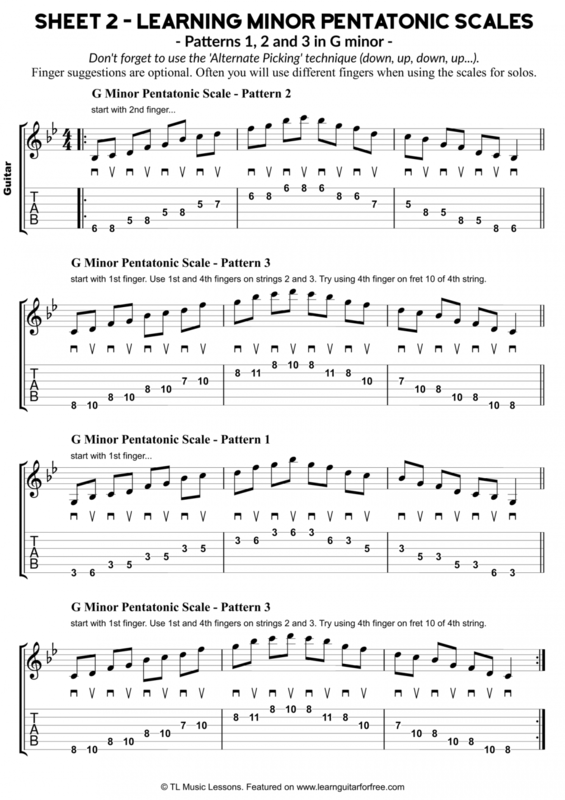 In this sheet we introduce the 3rd minor pentatonic pattern. This pattern appears twice in the exercise. We are trying to learn it but at the same time we will try and build relationships between the 3rd shape and the 1st and 2nd shapes. Make sure to go around the sheet twice to complete the exercise. This can be revisited many more times. I would spend at least one week’s worth of practice time focusing on one sheet at a time in this series, rather than rinsing all the sheets in one go. When learning the minor pentatonic scales (and most other scales too), it is important not to view them as boxes that you get stuck in when playing guitar solos. There are 5 shapes and the sooner you get used to linking them up and not lingering on one shape, the better. The scale shapes are a tool for navigating guitar neck and it’s useful to start linking up the shapes so that you can move from one shape to another seamlessly. The ultimate aim is to be able and to be comfortable moving between shapes, regardless of how many notes you have played in the scale. The aim is not to play up and down each scale and seamlessly to the next, it’s to be so comfortable with moving between shapes that when you start playing guitar solos, you can move between the shapes without needing to follow the full scale. So, for example play a few notes of Shape 1, and slide up to shape 2 and play a couple more, and maybe quickly switch up to a combination of notes on shapes 4 and 5. When you are comfortable, stick on a song in the given key and try playing the scales along. Then try improvising some melodies, or maybe some guitar solos if you are ready, using a combination of the 2 scale shapes. Try doing these along with some music. Use songs in the key of G minor to play along with.